Number four in our festive A-Z of iconic chairs is the birch plywood Domus Chair by Finnish Modernist designer Ilmari Tapiovaara. An advocate of social design, Ilmari Tapiovaara used local materials and techniques to allow his designs to be manufactured relatively inexpensively so they could be used by all. "Tapiovaara wanted good design for everyone," said Jukka Savolainen, director of Helsinki Design Museum – which hosted an exhibition of Tapiovaara's work earlier this year. "He did Ikea before Ikea, good quality pieces at an affordable price – the same kind of packaging and mass production ideas as Ikea has done." The designer created the Domus Chair in 1946 as a multipurpose seat for the Domus Academica student housing complex in Helsinki. 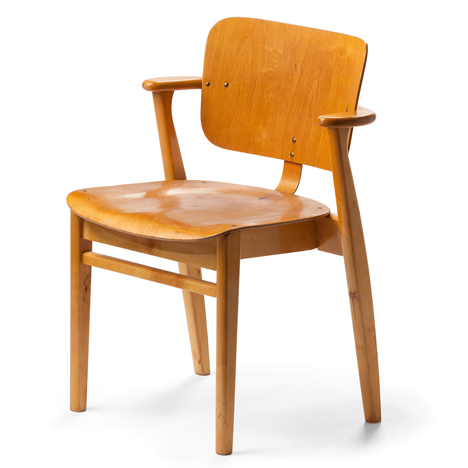 Its pressed birch plywood seat and back were shaped to form a comfortable work chair in the student rooms, while the stackable solid birch frame meant it could save space in hallways, canteens, seminar rooms and auditoriums. Being stackable, the chair could also be efficiently packed into shipping crates and transported worldwide. It was particularly exported to the USA, earning the designer an international reputation as well as fame in his home country. "He's so iconic in Finland. Finnish people know his chairs and only his chairs, everyone sat on his chairs at school," Helsinki Design Museum chief curator Suvi Saloniemi told Dezeen during a tour of the exhibition, where a selection of its numerous iterations – including a larger armchair – were displayed in a dedicated room. "It was one of his most famous, most produced and most reproduced chairs," said Saloniemi. "I heard you can still find the chairs in Texas gas stations and similar places." The chair is currently manufactured and distributed by Finnish furniture company Artek, which owns the rights to produce Tapiovaara's designs. It is available in a range of woods and colour-stained finishes, with optional upholstery for the seat and back.